Q: I am fighting bladder cancer, and I am interested in exploring ways to prevent or delay a recurrence. I viewed your presentation, “Development of Sulforaphane as a Nutritional Supplement,” and I see promise in a dietary approach to prevention. Can you comment? A: Mustardseed powder has been used in traditional Chinese medicine, Ayurvedic medicine, and other traditional and folk medicines for millennia. Mustard is a cruciferous plant, and its seeds are among the richest known sources of allyl isothiocyanate. Work in our lab has demonstrated that pure allyl isothiocyanate selectively targets human bladder cancer cells via the urine, spares normal human bladder epithelial cells, and inhibits bladder cancer development and muscle invasion in a rat bladder cancer model. In light of human bladder tissue’s unique exposure environment, bladder cancer occurs in what may be one of the best candidate tissues for a therapeutic and perhaps a preventive approach that employs dietary isothiocyanates. Shortly after their consumption, isothiocyanate compounds and their conjugates build to very high concentrations exclusively in the urinary bladder and, therefore, are able to exert their selective activity against tumor cells in the bladder epithelium. A study we published in Carcinogenesis in 2010 showed that in a rat bladder cancer model, not only was bladder cancer growth markedly inhibited, but all muscle invasion was blocked, and key proteins involved in cell growth, division, and death were significantly modulated by dietary mustard seed powder – possibly the perfect storm against bladder cancer. Although the study was conducted using the predominant isothiocyanate found in mustardseed, we believe that the conclusions may apply equally to sulforaphane from broccoli sprouts and to moringin from Moringa oleifera. Bhattacharya A, Y Li, KL Wade, JD Paonessa, ​JW Fahey​, Y Zhang. (2010) Allyl isothiocyanate-rich mustard seed powder inhibits bladder cancer growth and muscle invasion. ​Carcinogenesis 31(12): 2105-2110. Fahey JW​. (2010) Beyond the Abstract – Allyl isothiocyanate-rich mustard seed powder inhibits bladder cancer growth and muscle invasion. ​UroToday​. November 5, 2010. (www.urotoday.com). Q: You and others frequently call sulforaphane an indirect antioxidant. What does that mean? A: Oxidative stress is thought to be at the root of many diseases and pathologies OR to be a consequence of those conditions OR both. 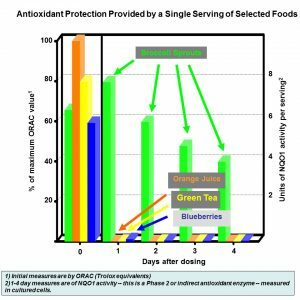 Many classic antioxidants (e.g. vitamin C, tocopherols or vitamin E, and beta carotene) act directly by terminating chain reactions initiated by free radicals or by directly quenching oxidants or reactive oxygen species. These are direct antioxidants – they directly, and sacrificially prevent oxidation. In contrast, sulforaphane induces or up-regulates a very wide range of protective enzymes in the body. Many of these are directly involved in countering oxidative stress. These include the enzymes controlling production of the body’s most ubiquitous and concentrated antioxidant, glutathione (or GSH). Sulforaphane does not directly quench or inhibit oxidation since it is not have what chemists call “redox activity”. Rather, it enhances and increases many [direct] antioxidants that in turn protect cells from oxidative stress. Thus, we call sulforaphane an indirect antioxidant. The immediate and direct antioxidant power of one serving of broccoli sprouts is similar to one serving of orange juice, green tea, or blueberries (0 days; left panel). One day later, sulforaphane-rich broccoli sprouts are very powerful indirect antioxidants (8 million units per serving; right panel). 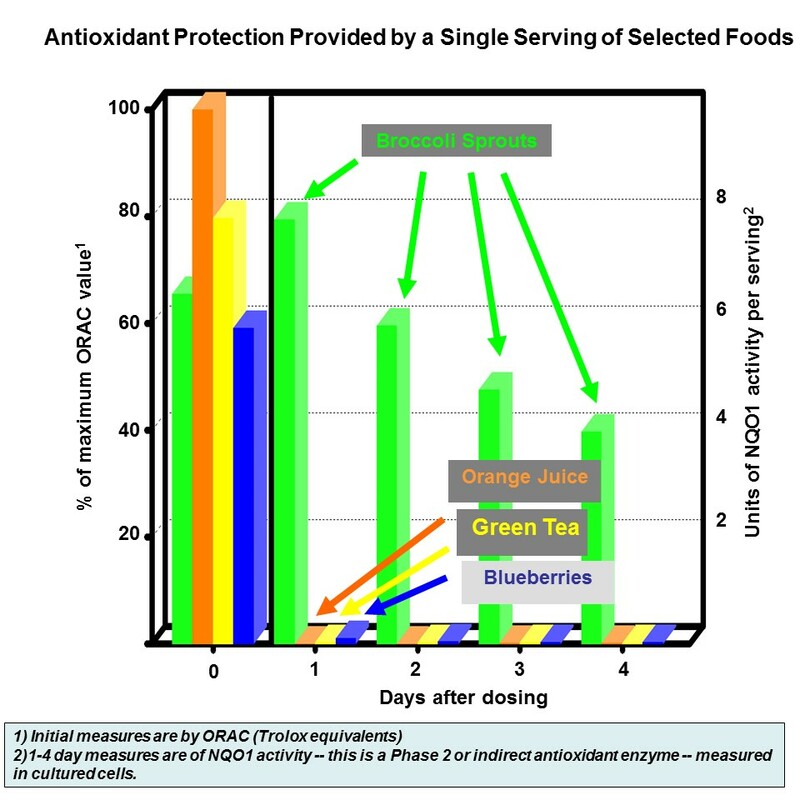 In contrast, the other foods retain only very weak indirect antioxidant activity (thousands of units per serving). Notably, broccoli sprouts still retain one half of their high indirect antioxidant potency, even 96 hours later. These FAQs address questions from people who viewed or listened to the recently posted webinar or podcast highlighted in our January 6, 2017 posting on the “News” tab of this website. Q: (Bioavailability) You say that sulforaphane bioavailability can be estimated by measuring the sulforaphane and its metabolites (DTCs) excreted in the urine collected over 24 hours from people. What DTC urinary excretion have you historically seen in the following scenarios: giving sulforaphane (SF) alone, giving glucoraphanin (GR) alone, and giving GR with an active myrosinase enzyme source? Q: (Bioavailability) Is there great person-to-person variability in those numbers? A: Yes. It has to do both with our innate metabolism (as a result of our genetics) and the metabolism of our unique gut microbiome (the bacteria that colonize our gastrointestinal tract). Q: (Bioavailability) Is there any way to tell what kind of a converter you are (e.g. what is the bioavailability of SF to you)? A: At this time, not without having non-standard laboratory tests performed on yourself after having followed a rigorous experimental protocol. We are, however, working on a personal test kit that you should be able to test yourself with. It is not ready yet, though. Q: (Can you recommend. . .?) Are there good sulforaphane supplements and bad ones? A: Absolutely! However, we have only tested a small fraction of the hundreds of supplements that represent themselves as containing meaningful amounts of sulforaphane or sulforaphane-producing compounds — SF, GR, GR + myrosinase, broccoli, broccoli sprouts, or broccoli seeds. Remember that GR (glucoraphanin) plus active myrosinase (an enzyme) produces SF (sulforaphane). Q: (Can you recommend. . .?) Can you recommend any particular brand of broccoli sprouts? A: We try to avoid such endorsements. As you may know, in the late 1990s Drs. Paul Talalay and Jed Fahey founded a company to promote broccoli sprouts and other chemoprotective foods. This company, Brassica Protection Products, no longer is involved with broccoli sprouts in the USA, but they do sell broccoli seed extracts to the supplement industry. Paul and Jed removed themselves from any and all management, advisory, or financial relationships with that company many years ago because it created a conflict of interest with their continuing work on broccoli sprouts. So while we choose not to suggest any particular brand of broccoli sprouts, it should be said that when you buy them in the grocery store be sure to purchase only fresh-looking broccoli sprouts. Do not buy them if they are wilted, watery, slimy or foul-smelling. Most sprouts do not have a particularly long shelf-life, and if produce managers are not vigilant, packages of sprouts sometimes stay on the shelf too long. In Japan and some other parts of Asia there is more of a culture of fresh vegetable consumption and by-and-large they take great pride in the quality of their fresh vegetables including sprouts. The Cullman Chemoprotection Center has been very fortunate to have received early support from a Japanese sprout company (Murakami Noen) and a Japanese food company (Kagome Company), and it has been an eye-opener for us to witness the affection and respect with which fresh food is treated there, compared to much of this country. Q: (Can you recommend. . .?) Can you recommend any particular brand of supplements containing either SF, GR, or GR + Myrosinase? A: This is a more difficult question for us to answer. The supplements that we are using in clinical studies and recommending to fellow investigators are: Avmacol (Nutramax Laboratories, containing GR + myrosinase), Crucera-SGS (Thorne Research, containing GR alone), and Prostaphane (Nutrinov; a French company which does not export to the USA, this supplement contains [active] SF produced from broccoli seeds). We have started using supplements in our clinical studies precisely because there are now some good, consistent, and safe supplements on the market. Consistency is really crucial as studies need to be carried out on quality products that deliver standardized amounts of key ingredients with minimal batch-to-batch variability. This is a standard that we, as an academic laboratory, could not hope to maintain forever, but it is something that diligent and conscientious supplement producers can readily accomplish. Remember that broccoli itself is highly variable with respect to the concentration of these plant compounds, so just seeing products that say they contain broccoli does not mean that they have active ingredients, nor does it indicate how much they contain or guarantee that to the consumer. This is a problem that has plagued the supplement industry for some time now. We have analyzed many supplements over the years, and there are some very poor supplements. Many of them are terrible in that they do not contain what they say they contain, they contain far less, or even only trace amounts, or they contain materials that are not even broccoli or related to it. We will test more commercial products and periodically update this post with the information we generate. Q: (Can you recommend. . .?) Are there “active” freeze-dried broccoli sprout powders that you recommend? A: We have not evaluated any such powders that are on the market. When we have utilized such powders, we have made them ourselves at the Cullman Chemoprotection Center. As described in the webinar, the way in which they are prepared is very critical. Q: (Can you recommend. . .?) Are there specific producers of moringa powder that you recommend? A: The critical issues here are: (a) sanitation, (b) identity, and (c) responsible sourcing. Get reassurance from the vendor or retail supplier (e.g. Whole Foods) that the powder you are purchasing has been responsibly (e.g. sustainably and non-exploitatively, and ideally organically) produced, that it has been verified to be Moringa oleifera (the Latin binomial for what is commonly referred to as “moringa” in the USA markets, and that the levels of associated bacteria have been checked and do not exceed regulatory thresholds. Retailers should have this information on a batch-by-batch basis from their suppliers. The presence of “some” bacteria on leaves is unavoidable for these are not sterile commodities. Q: How sensitive is moringa powder? A: Moringa leaves are very different in structure from broccoli sprouts. They are typically dried either outside in the sunlight, outside under shade-cloth, or in ovens or enclosed ventilated driers. Sunlight and excessive heat (after harvest) will rapidly degrade some of the phytochemicals and vitamins of interest in the leaves. Q: Can I grow my own broccoli sprouts? A: Yes, but follow safe practices for washing and sanitizing the seeds before growing. Be sure to buy seeds that have NOT been treated with pesticides and are specifically designated “for sprouting”. Most seeds used for horticulture/agriculture are pre-treated with insecticides, fungicides, dyes or bulking agents. You do not want to use these. A: “Cold-pressing” has big advantages when one is talking about squeezing the oil out of seeds (e.g., low heat and no hexane or other harsh solvents). However, when talking about broccoli sprouts, the advantages are less obvious. First, not much pressure is needed, and the generation of heat in the process is not a concern. Second, one leaves behind all the fiber when one juices. Third, all the myrosinase gets activated the second you “squish” because you break open the plant cells . . . so if you were to drink that juice immediately, you would get most of the benefit of sulforaphane, which would theoretically be generated in the juice within a matter of seconds to minutes — however there’ll be no shelf life to that juice. Q. Are “micro broccoli” different than broccoli sprouts? Do they have as much sulforaphane as the sprouts? A. “Micro broccoli”, “micro greens” and other larger plants (seedlings) generally don’t have as much sulforaphane per gram (per pound or per ounce) as “sprouts”, but they should have more than market stage heads (the common vegetable form of broccoli). By the way, the heads of broccoli ARE more potent than the stems, for those of you who would prefer to leave the stems behind — but they all have plenty of fiber.